Here's an in-depth look at the new LG Versa, which has a touch screen and detachable QWERTY keyboard. See where it excels and where it falls a bit short. It's hard to classify the LG Versa, as it really has two personalities. It can be a svelte, touch-based phone that is basically an updated version of the LG Dare, or it can be a not-so-svelte, QWERTY keyboard-equipped messaging device. Having flexibility is nice, but transforming the Versa between its two different personalities is, quite frankly, a pain. This means you're only going to use it one way or the other, and not switch it up all that often. Which raises the question: why have the ability to switch at all? Today Verizon Wireless and LG announced the LG Versa - short for versatility. The Versa's stand-out feature is its combination of a 3-inch touch display with a QWERTY keyboard that can be attached or removed at will to suit the user's needs. FitBit this week released its Versa smartwatch and said new features for the wearable will arrive as soon as next month. A software update to be made available in May will bring quick replies to people who pair their Versa with an Android device. FitBit today announce a range of new wearables, including a new smartwatch and a new fitness tracker specifically for children. The Versa is a smartwatch aimed at the masses thanks to its $200 price point and solid list of features. The phone is brown, not maroon. When the hell are these companies going to learn??? Verizon does include their mobile email with their data plans (the connect plan). While Vcast offers unlimited data, it was built for the Vcast Video portal. With the new connect plans you get mobile email and unlimited data. A good review overall. I'm actually one of the ones that enjoys the phone with the keyboard attached, and after you mess with it a bit switching between the two isn't hard. Connect plan is also $10 over the cost of the Select plan, while Vcast is $15 more. The worst part about this phone is that it will most likely sell really well on Verizon. Then more companies will make crappy detachable phones like this. next thing we know Nyko will make a keyboard attachment for the iPhone. This is the beginning of the end. I couldn't agree more. What a dreadful, horrible design. Reverse the Versa. 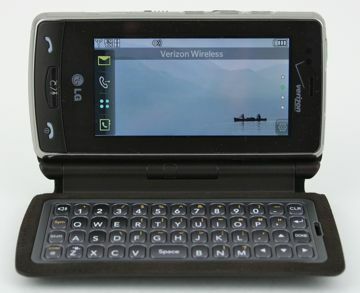 Verizon has always had the best messaging phone. AT&T never had one unless it was a PDA until the end of 08.